As you advance in years, the need for physical activity does not decline. Older adults need regular exercise to keep themselves fit and their bodies strong. This does not mean, however, that you should jump on the first fitness bandwagon you see. Many of these programs are geared towards a younger population and without proper guidance, you run the risk of an injury. There are many other ways seniors can get the exercise they need without compromising safety. Many older people enjoy a peaceful stroll at an easy pace—it is enough to get the heart rate up without putting too much pressure on the bones and joints. Others, however, much prefer to get their daily dose of physical activity in the comforts of their own home. A busy city, for one, is not particularly conducive to a nice, leisurely walk unless you find a relatively peaceful park. For this dilemma, a recumbent bike offers seniors a lot of benefits without the risks of injuries a traditionally upright bike can cause. You will be quite happy to know that there is no shortage of recumbent bikes available on the market. This article will show you the best recumbent bikes for seniors to help you maintain a physically fit body regardless of your age! What Benefits Can Seniors Get Out of Recumbent Bikes? Even though you might be getting advanced in years, it is still advisable to get a bit of exercise in. Light to moderate-intensity workouts can do you a world of good and can keep your body fit and strong. These recumbent bikes can help you to achieve that without the added strain and difficulties you might get from other exercise equipment. Buying the best exercise equipment means straddling the delicate balance between features and price. Generally speaking, feature-rich equipment usually cost a lot more. 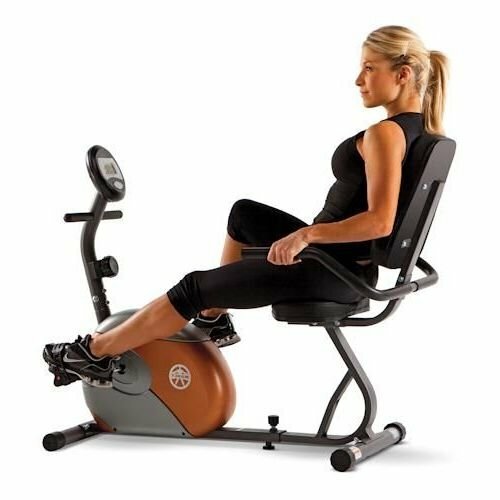 The Nautilus R624 Recumbent Bike is a pretty affordable recumbent bike with a lot of features that can suit anybody from the beginner to the experienced gym buff. It has twenty resistance levels and twenty-two preset programs you can choose from, depending on your fitness level. It also features the trademark Nautilus DualTrack™--a two-LCD window system, which allows you to cover one and still track your workout. NautilusConnect allows you to export data and track goals so you can track your progress. There is also a USB charging port which allows your device to connect to NautilusConnect and the popular fitness app, MyFitnessPal. If you have already started looking around for a recumbent bike, no doubt you have heard of Exerpeutic. This is a brand that is known for their recumbent bikes, particularly the Exerpeutic 900XL. This brand is marketed by Paradigm Health and Wellness, which is also quite popular for their fitness equipment. The manufacturers took some of the best features of the 900XL model to create the Exerpeutic 2000. It operates with the same flywheel and drive system as the previous models, giving you a smooth and consistent pedaling experience. For this model, Exerpeutic uses their new Air Soft seat for increased comfort. Its step-through design also makes it easier to get on the bike. This model comes with eight levels of resistance and six preset workout programs. It has a user weight capacity of 300 lbs. The trouble with most exercise equipment is that they tend to take up so much space. This isn’t much of a problem if you are going to the gym or you have a dedicated room for fitness in your home. However, when you have limited real estate, things can get pretty cramped really quickly. 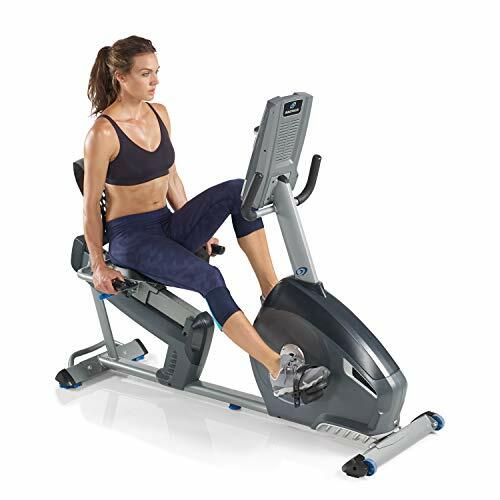 The Marcy Magnetic Resistance Recumbent Bike ME-709 takes care of this dilemma. At first glance, it does not look like anything much—just the basic frame of a recumbent bike with a small computer monitor. However, in spite of its space-saving frame, it is surprisingly well-constructed from 2-inch steel tubing that keeps still while you exercise. It has eight resistance settings that you can modify to suit your fitness level, whether you are a newbie or a gym buff. It does not have preset programs, though. At quite an affordable price, this recumbent bike does away with the excessive fancy features to stick to the basics and do what recumbent bikes do. 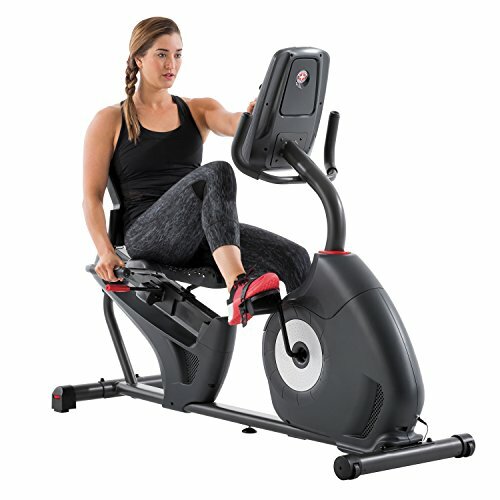 If you are a bit of a techie and want a recumbent bike with all the fancy trimmings, you might want to take a look at the Schwinn 230 recumbent bike. This unit has a whopping 22 preset workout programs, heart rate monitor, and speakers. It has 20 resistance levels you can choose from to suit your level of fitness. It even has a USB drive to store your data, which can be uploaded to the Schwinn Connect website. If you are big on tracking your progress, it is also compatible with the popular fitness app, MyFitnessPal. This model has a user weight capacity up to 300 lbs. It also has a USB charging port and a media tray, which you can use to indulge while exercising. If you like listening to some classic tunes during your exercise routine, you can also plug in your MP3 player and stream songs through the console. 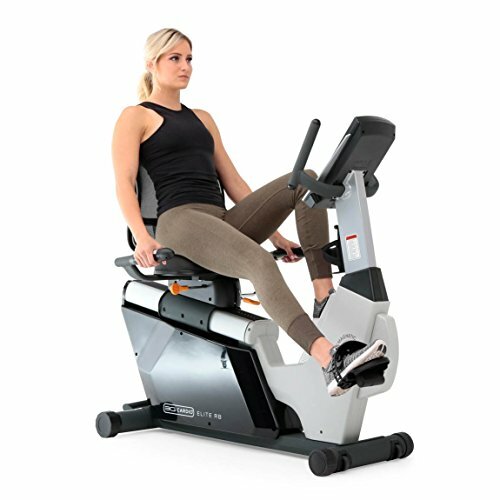 The 3G Cardio Elite RB Recumbent Bike is a light-commercial bike featuring an incredibly comfortable seat and a backrest that conforms to your body shape and size. It does not try too hard to be one of the fancier bikes and sticks to doing what recumbent bikes are supposed to do—provide you a way to get some cardio workout in the comfort of your home. It occupies a significantly smaller footprint than other recumbent bikes with more or less similar features. It is not foldable but it has front rollers which will allow you to relocate and easily park the bike in an unobtrusive corner when you’re not using it. This bike has a user weight capacity of up to 350 lbs. It has a motorized magnetic resistance system, which can be adjusted from the console or in the seat’s handlebars. It has sixteen programs you can also choose from and can accommodate data for up to 4 users. Recumbent bikes are great for a light cardio workout at home but it focuses mostly on your lower body—i.e. your legs do the pedaling while your arms and upper body basically do nothing. Now, if your hands are busy knitting or flipping through your tablet, this wouldn’t be much of a concern. However, for those who want to keep their upper body occupied as well for a total fitness workout, the Stamina Elite Total Body Recumbent Exercise Bike has your back! This isn’t just your usual recumbent bike where you sit back and pedal until you’re bored out of your mind. It actually has upper hand pedals that let your arms to amp up your workouts and burn more calories, if that is your thing. If not, you can choose not to use these upper pedals and just cycle to your heart’s content. The bike has a solid steel frame that looks very sturdy. The only caveat is that the console does not record your workouts so you’ll have to do this the old-fashioned way. There are no preset programs either so you’ll have to pay attention to your workouts on this unit. This is a bike comes with a console that is powered to do a lot of things. For the techie who is constantly connected to the world via smartphone, the Proform 740 ES Recumbent Bike has a 7-inch, multicolor display that feels much more like a tablet than a clunky console that blinks out numbers. This bike’s powerful console has an astounding thirty-four preset programs, not counting the programs you can access with your iFit account if you sign up for the membership. It also has one of the broadest resistance levels—numbering at 26—which you can adjust to your fitness level. Exceedingly sturdy and well-made unit, using quality materials, with a user weight capacity of up to 350 lbs. Unlike the traditional bicycle where the rider assumes an upright position while balancing on a narrow seat, the recumbent bike allows the rider to assume a laid-back position. This results in a more comfortable position that evenly distributes the weight of the rider over a much larger area compared to the traditional upright bicycle. For seniors, the stationary recumbent bike presents a safe and comfortable way to engage in some form of exercise. Most of these units also allow you to adjust the reclining seat for maximum comfort and stability. Different models will also give you different features like heart rate monitors, mileage trackers, as well as adjustments for speed and resistance if you want a bit of a challenge. It is important for seniors to have some regular physical activity to keep their bodies fit and strong. A stationary recumbent bike can help them exercise from the comforts of home while offering them a ton of benefits. These are the key benefits of recumbent bikes for seniors. The problem with upright bicycles is that they have very small seats, which can result in difficulties in maintaining balance, as well as a pretty sore bum if you stay on it for too long. 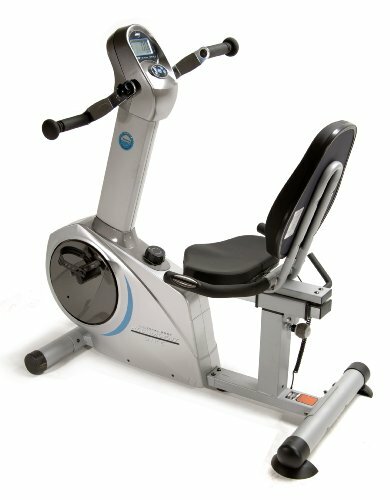 The recumbent bike has a larger and softer bucket seat that is more comfortable and provides a lot more stability than balancing on a narrower seat. As we age, our bones undergo changes and are not as strong as they used to be. This is particularly true for seniors who have not stocked up their calcium stores in their youth. These changes can cause older adults to experience severe pain when they are in a less than ideal position or if they do not have the proper support. The reclining position assumed by the rider in a recumbent bike takes care of this problem by providing adequate back support that seniors need. With this, the rider can assume a comfortable position with proper posture and prevent back or shoulder pain. Getting on an upright bicycle can be difficult for older people—not to mention dangerous!—as they have to swing one leg over the seat to get their leg on to one pedal while maintaining one foot on the other pedal. When you are younger and agiler, this might not pose much of a problem but imagine doing this when you are over seventy and you’ll get my point! Recumbent bikes are built lower to the ground compared to upright bicycles. This makes it easier for an older adult to step into the exercise machine and sit down. Because of this position, it also decreases the chances of an injury during a fall because it is not as high up as an upright bike. Most stationary recumbent bikes not only come with larger, cushier seats, they also come with an option to adjust their seats to suit their level of comfort. All you have to do is sit down and, depending on the model, pull down or turn the handle to slide the seat into the position you want, then tighten the knob. Compare this to an upright bike where you have to go through the complicated process of getting off the bike, pulling out the pin, adjusting the seat, and re-inserting the pin. You might not mind this much but for a senior, this could prove to be an unnecessary hassle, especially if you share the bike with others and have to readjust the seat every time you use it! When you get older, your body changes, too. Your joints become stiffer and your bones become a lot more prone to fractures. Exercises you would normally find easy when you were younger become a lot more difficult and even painful. You need to exercise more caution when working out, especially when it comes to your weight-bearing joints, i.e., your hips, knees, and ankles. These joints receive the most stress throughout the day. When using a recumbent bike, the pedals are set in front of you, which makes it a lot easier on your hips, knees, and ankles. Your reclining position also makes it a lot more comfortable for the joints of your lower back because the seat and the position itself provide ample support. Most stationary recumbent bikes nowadays come with a lot of features to make exercising a breeze as well as keep track of your progress. Modern technology has allowed for things like heart rate monitors, mileage trackers, as well as speed odometers to be integrated into these exercise equipment. If you’re up for a challenge, you can even adjust the speed and resistance to make you work harder for it and sweat more. Some recumbent bikes even come with several workout options programmed into the system so you’ll never get bored but continue to progress physically at a comfortable pace. What could possibly be more comfortable and convenient than being able to exercise in your own home? Exercising in front of the TV, that’s what! Simply position your recumbent bike to face the telly and your workouts will cease to become a chore as you pedal away while enjoying your favorite show. If the screen is not necessarily your thing, most recumbent bikes also come with a book or magazine holder to allow you to enjoy a nice book while you exercise. Because of its design, a recumbent bike gives a lot of support for your lower back, providing you with a comfortable way to exercise that is gentle on your weight-bearing joints. This same design also helps with balance so you don’t fall off. If you do, it’s quite lower so there are fewer chances of serious injury. Your feet will be strapped to the pedals so you don’t run the risk of slipping off those pedals or getting entangled in them accidentally. However, it can be easy to overwork yourself so keep checking your heart rate monitor to make sure you are within the allowable range of your target range! Even older adults need to get some exercise, too, although their advanced age usually comes with different concerns. For one, positioning and support are very important as assuming a less than ideal position lacking in support for long periods of time could cause body aches. For this reason and others more, the recumbent bike is an ideal option for seniors who are looking to keep fit over the years. The larger bucket seat and lower back support make for a comfortable exercising experience. Because the recumbent bike is also designed to be lower to the ground, this also minimizes the chances of accidental falls, which could cause serious injury to older adults. A recumbent bike with a step-through or walk-through design is even better as it is easier to get on such a unit. 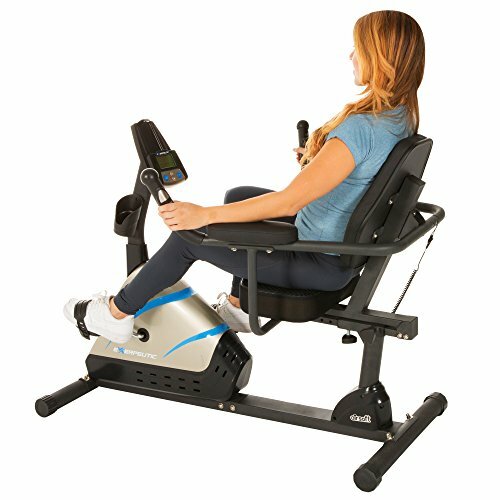 The Nautilus R614 Recumbent Bike is the ideal option for seniors looking for a fun and safe way to exercise. It is well-made and quite sturdy so you won’t have to trouble yourself with a unit that breaks down after just a few uses. It also uses the ECB magnetic resistance, which is the best kind, allowing the user to experience a smooth and quiet pedaling experience. Whether you’re a pro or new to the concept of using a recumbent bike, this unit offers 20 resistance levels you can choose from to suit your fitness level. The console also has twenty-two preset programs to choose from to keep your exercises from becoming tedious and boring. 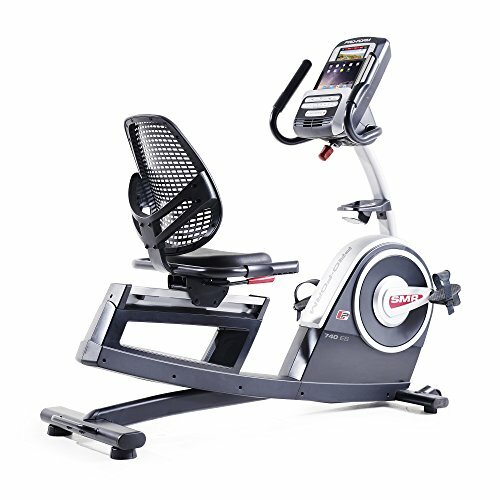 For the techie at heart, the Nautilus R614 Recumbent Bike also allows you to export data to the NautilusConnect website or the popular fitness app, MyFitnessPal. This will allow you to track your progress and assess your fitness goals. It also features a walk-through design, which makes it easy to get on and use, minimizing the risks associated with getting on an exercise equipment with a different frame design. I hope this article was able to help you in your search for a recumbent bike for seniors. It truly is a safe and convenient way for an older adult to exercise so get on that nice, cushy seat and start pedaling!